Hello! Welcome to the Autumn Newsletter from your new (old/previous, etc) editors! We have audition results, the report of the AGM from September and snippets of news and contributions from our members. 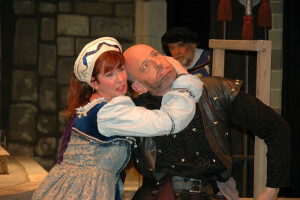 Auditions were held on 29 September and the above cast was announced. Sheila and I had a most enjoyable, and challenging, afternoon with a high standard of auditionees. We were delighted to be able to cast the production with a mix of experienced performers and talented newcomers, some of whom had joined us last year for Pirates. Music rehearsals are now under way and we look forward to seeing what Sheila has in store for the society after Christmas! Our usual talented creative team of set constructors and artists are hard at work bringing the Portsmouth harbour to the Maddermarket! Ahoy, me hearties! Thinking ahead, we will be looking for a prompt for the show as Mary Betts has stood down after many years of excellent service for which we tare most grateful. If you are interested and would like to know what the job entails, please contact Sheila Tuffield. After “Pirates” had finished its run, we set about rehearsing for the rounds of summer concerts, the highlight being asked to sing at Sue Catchpole’s wedding to Richard. 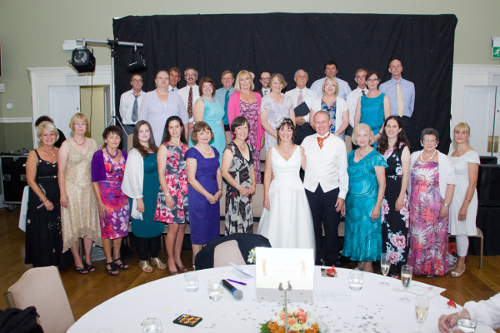 The photo below shows the happy couple surrounded by members of the Society who were delighted to be part of the celebrations. We wish Richard and Sue a long and happy life together and thank them for inviting us to be part of their wonderful day. On 1st June, we were invited to be part of Hoveton’s celebrations, performing G & S and other songs for an appreciative audience, which joined in the final patriotic songs with great gusto and flag waving! 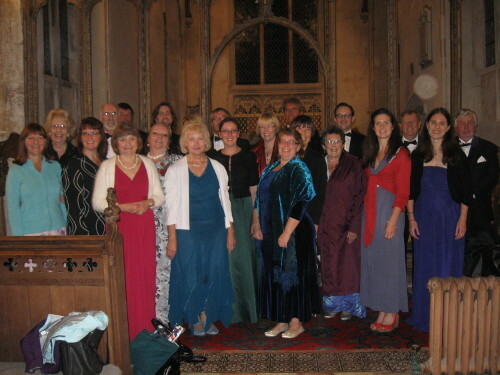 ENOS had performed their first operettas at Hoveton Village Hall so it was a delight to be part of their anniversary jollities. 14th September was the date of the concert held at St Botolph’s Church, Trunch. The title was “An Evening of Wit and Song” which let the imagination of the performers run riot! The picture shows the witty, song filled faces of the cast!! 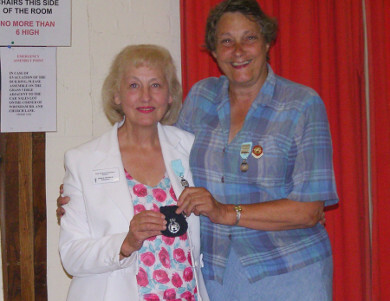 The Society’s AGM was held on 3rd September. 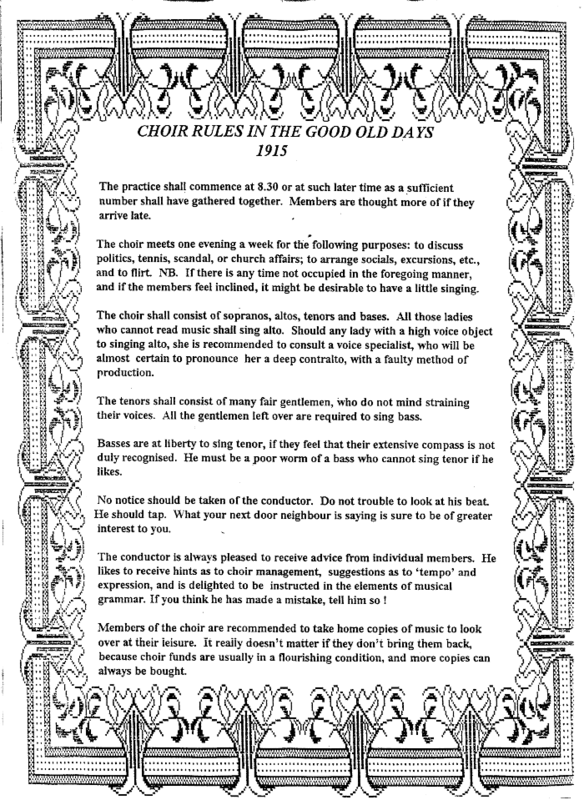 The new committee and the officers are listed on the front of this newsletter. Sheila as Producer and myself, as Musical Director, gave brief descriptions of our hopes and expectations for next year’s production of HMS Pinafore which will also include Trial by Jury as a show within a show. 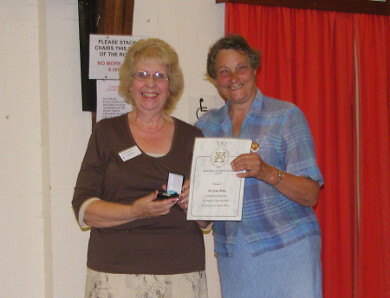 We were pleased to welcome Sue Dupont as our NODA representative to present NODA long service awards to Sheila Tuffield for 40 years' service to amateur dramatics and Janet Barley for 25 years. Several ENOS members went to Sheringham Little Theatre on 21st June to say goodbye to Sheringham Savoyards who are disbanding after 34 years of performing (mainly) Gilbert and Sullivan in North Norfolk. Their final show was HMS Pinafore, which had been their first offering in 1979 and which was played to packed houses on the 20th and 21st June. Those of us who had performed in Sav’s shows in the past were invited to join the Society for their Farewell Dinner at the Burlington Hotel, Sheringham on 17 May. It was a wonderful evening and lots of happy memories were re-kindled. "A Ceremony of Carols", Barton Turf Church, Sunday 8 December at 7.00pm. Entry by programme £8 adult, £4 child inc refreshments in advance from Kathy Clark 01603 760669 or on the door. Taverham Garden Centre, Wednesday 20 November evening and Sunday 15 December at 2.30pm. A few thought provoking comments here to ponder – thanks, Marion, for this piece! Member Profile - Your Editors! Ros: Ruddigore, 1999. I was fortunate to audition and get the role of Mad Margaret, which I was desperate to play. Clive: Patience 1996, I joined to be a Dragoon but was asked to audition for Grosvenor - me, a poet? Hah! Ros: Tricky…last year’s Pirates takes some beating for me, it was so witty and stylish but Ruddigore of 1999 was amazing; I couldn’t believe that I was performing alongside the wonderful late Alison Tuffrey and Pam Warren who I had admired for so long. Clive: Mikado 2009, love the Mikado and always wanted to play Pooh-Bah. Clive: Celery, tasteless and like a mouthful of cable ties. Ros: Corrie. Can’t miss it. Film? Anything by the Coen Brothers, especially when they involve George Clooney. Clive: Schindler's List, true(ish) and fantastically made. Ros: My best role ever, I think, was playing Cherubino the pageboy in Mozart’s Marriage of Figaro with North Norfolk Chamber Opera. It was a very strong cast and I was thrilled to be part of it playing such a great character – I even had my hair cut very short! I’d love to play Mrs Lovett in Sweeney Todd. Clive: Javert in Les Miserables. Ros: Not keeping still when Clive is trying to tell me something – I’m a terrible fidget and find it hard to keep in the same place for very long. Clive: Perfection, there is no way up. Ros: Goosing a chap who I thought was one of my best friends – turned out to be a complete stranger. Clive: Swearing at work and hadn't realised that by mistake it had gone on air over BBC East news. Tony Hall then drew a cartoon of it in the next day's EDP. Ros: Generally, horses and dogs. Specifically, Polly, our beautiful, gentle ex-racing greyhound. Clive: Dogs but the one above specifically. Ros: Being allowed to play my father's double LP sets of D'Oyly Carte operas on the radiogram. I was about 7 and then would sing the whole operas on long car journeys! Arrrgggh! Clive: I can't even remember what I was doing yesterday! Clive: Anything I can lay my hands on but normally cereal or toast and more toast.